Situated in front of the main traffic circle leading into the stretch of beaches, the Village Beach is a declared active beach as it is frequently visited by youngsters and a famous meeting place for gals and guys, with parties that sometimes start even as early as noon. Only less than one kilometer north of Coral Beach, the Eilat Village Beach is open every day, from early morning until late night. The beach has a tanning raft that is always floating on the seawater, showers and clean toilets. There is also a sand court for those who want to play volleyball, while the parasols and tanning beds can be rented for a small charge. Eilat Village Beach is a free public beach, and the well-maintained facilities such as showers and toilets are handicap accessible. Disabled can reach the waterline easily. Bringing of food into the beach is not allowed. Whether it is day or night, it is a fun place to be. Village Beach is a beach with it’s own character. While peaceful and quiet early in the morning, the beach is filled with hedonism, freedom and youthfulness later in the day. There’s no doubt, this is the perfect beach to ‘party’ and celebrate. Come the evening, the beach transforms into a lively, vibrant place as the beach bar-restaurant loudly plays the latest modern music and organizes night beach parties, which are very well known in Eilat, drawing many young audiences of tourists and local Israelis alike. There is a wide range of drinks available and your stay is accompanied with good modern music. You will also likely see sunbathers from different parts of the world, relaxing on tanning beds only a few steps from the water and those enjoying the fascinating vista. After spending a long day, prepare for the beautiful finale – the Eilat Beach Sunset. As the sun sets beyond the hills of Eilat City, simply relax, sit back and watch the stunning mountains of Aqaba while they turn amazingly red. Finally, after dark, you can join the dancing parties and pubs. 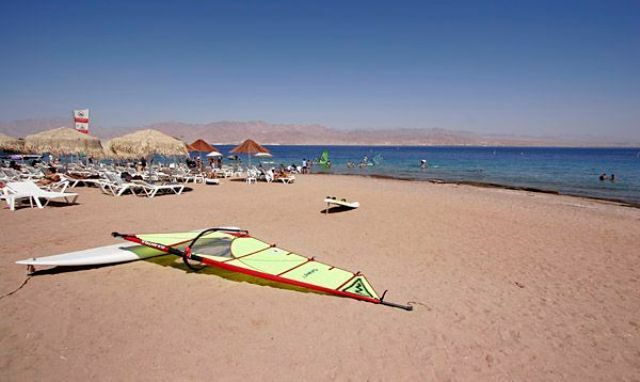 Besides the parties, the Eilat Village Beach is a very famous place for snorkeling and diving. The dive territory is somewhat small, with slopes dropping off so close from the shore. This means that in just a few minutes, you will reach between 20 to 40 meters deep. As such, there are basically little to no boat dives here. The visibility is great and the underwater life in the Red Sea is abundant and truly rich, with many colorful fishes and aquatic creatures darting over coral gardens.